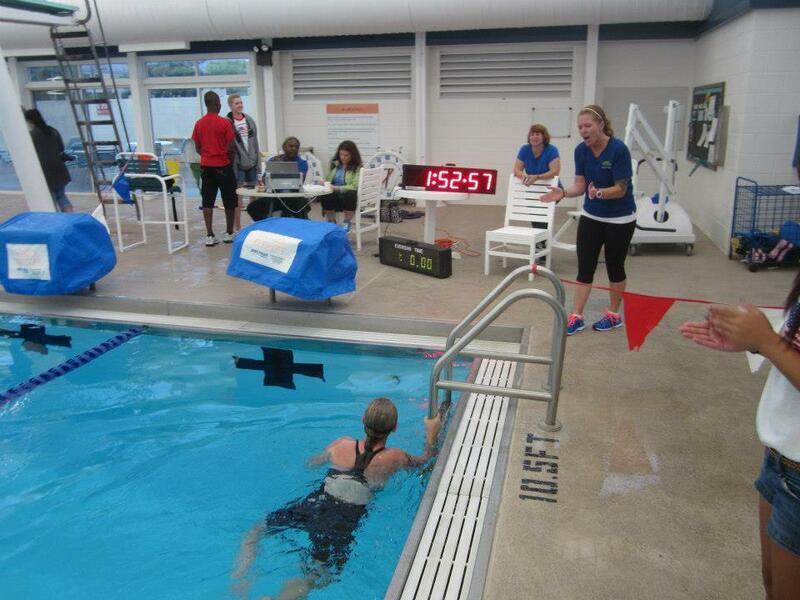 The Yucca Triathlon starts out with a 8k run, a 45k bike, and ends with a 400m swim. Mike and I had googled 8k and found out it was around 4 miles, so the whole time we kept thinking it was only a little more than a 5k on the run. Piece of cake. 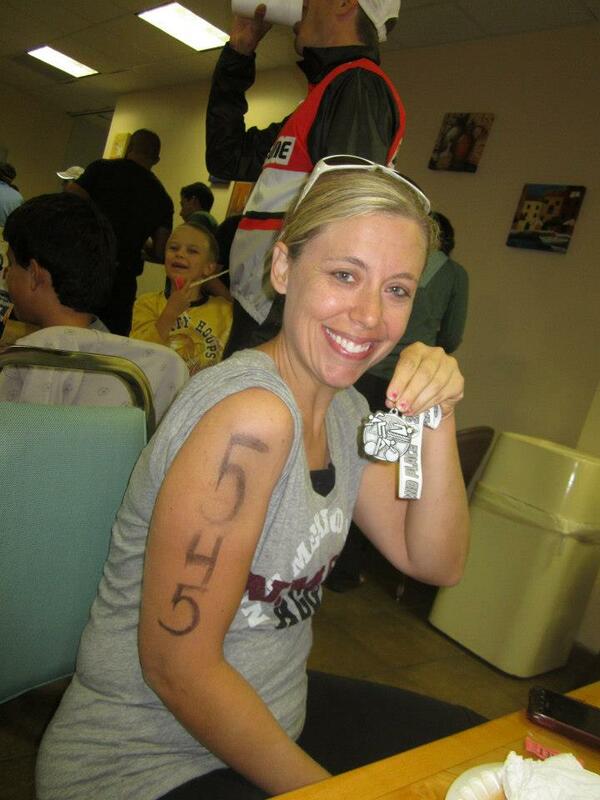 We didn’t look at the decimal until the night before and realized it was 4.9…5 miles! Mike was bummed because of all the rain, they had to shorten the ride to 14 miles. There was a terrible headwind, so it ended up working out that way. Judging by the picture of me coming in on the bike, you can probably guess what the weather was like! It was cold, rainy, and windy, which made it a memorable experience for the both of us. Mike took off on the 8k with no trouble and stayed with the group. His buddy Jason and I ran together in the back of the group (which was my plan all along). 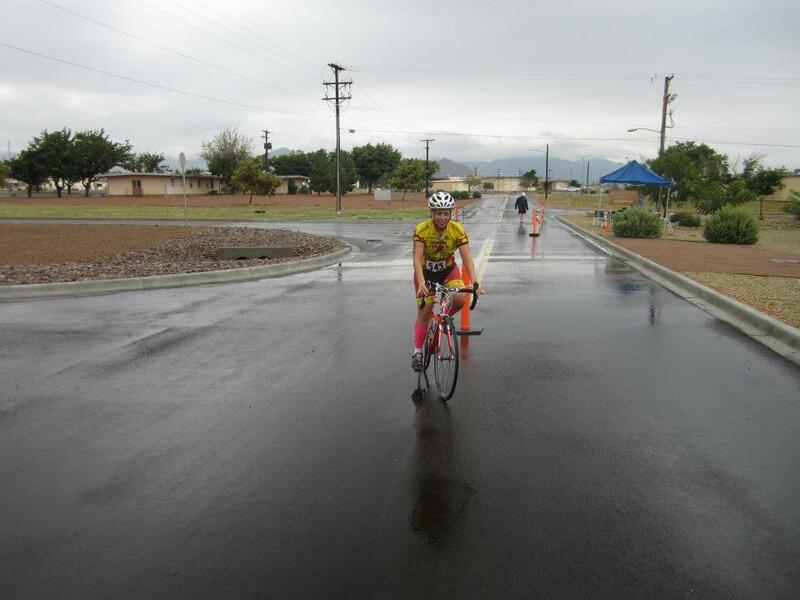 The transition to bike was pretty easy…grab a helmet, and put my bike shoes on and I was off! I’m guessing that part felt awesome to me because of all the biking I have done, but really, it felt awesome. The headwind decreased my speed in half on the way back. I was hitting almost 30 mph on the way out, but on the way back, it was 13-15 mph. The rain also decided to act up at that point too and the other riders looked so mad when I came up on them. 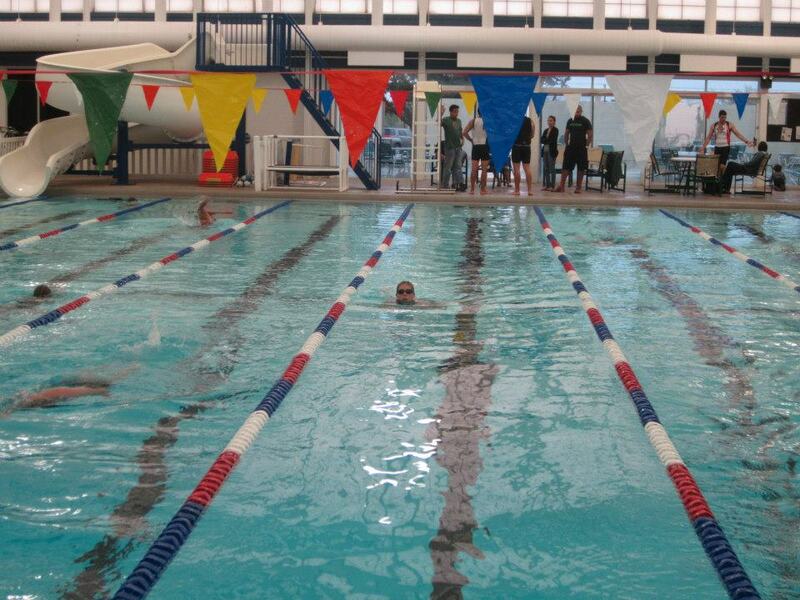 When I came back in, I was SO NERVOUS about the swim. It’s not that I didn’t think my muscles can’t do it. It’s my breathing. I can’t control it enough to go under water and I panic! I am so glad it was NOT open water. I like having the mental image of eight lanes to go up and down. Since I had a pretty good gap on the people behind me on the bike, I was glad to not have people behind me in the pool. I know this is normally first in a normal triathlon, and I wonder how people do it. But hey, I made it, even after stopping a few times for a few seconds to get my breath. I did it in 1:52 minutes while Mike finished in 1:28. The cool thing is that they print out all your times so you can compare them to all of the other racers. 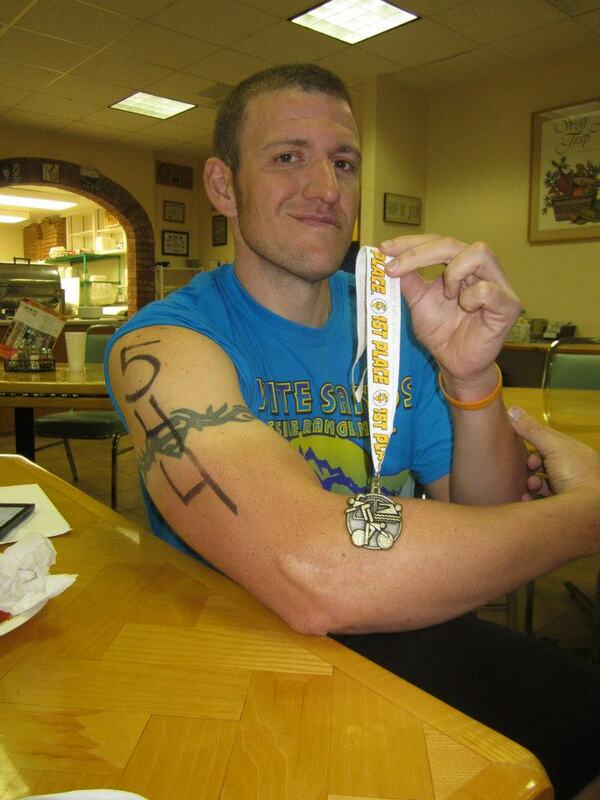 If I wasn’t so slow on the swim, I actually could have gotten first in my category (30-34)! I ended up in second place and I will take it! I love the no makeup and crazy swimming hair picture. Mike was making fun of my curly hair trying to escape. It was way crazy! Mike was in the category called Clydesdale, for guys above 200 pounds. He actually had one of the fastest bike times, so I think he would have done great in his normal category. He rocked it! We are very addicted and I had a lot of fun! Mike is sitting here right now asking me when is there another one we can do and I am wanting to do it again. Don’t get me wrong, we look like a bunch of 80 year olds walking around today, but it feels so good. P.S. I am taking a huge liking to swimming too! Mike and I are getting memberships to the local aquatic center. I am so excited! This entry was posted in 2012 Races, Fitness, Mountain and Road Biking, Recreation Ideas, Triathlons, Workouts by thefasteryoupedal. Bookmark the permalink.